But King’s journey started long ago. 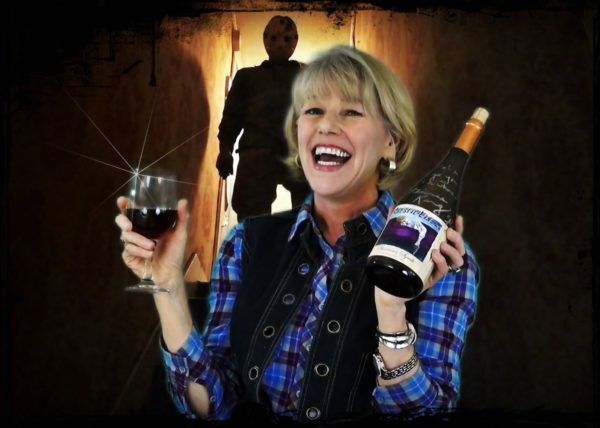 First, as a child actress who then became known as a “first final girl” (lone survivor of original cult classic film Friday the 13th) then background dancer in Saturday Night Fever, then top female voiceover actress, and now an artist and Crystal Lake wine purveyor at Valley View Winery. King got the acting bug early. She did her first commercial at six-month’s old and co-starred in Inherit the Wind at age eight. She still remembers the court scene that moved her to tears. In the middle of so much talent, she was a willing sponge. When she had downtime on sets, she would draw and paint. While sitting in the garden of the Metropolitan Museum of Art, she created her first signed work of art and handed it over confidently to an interested party. “Confidence can get you through the worst of times,” King comments. Then, after returning to the States, she met her husband Richard Hassanein, founder of United Film Distribution and president of Todd-AO Studios, a post sound production company. They lived in Los Angeles and King began doing voiceovers and looping (putting her voice in other characters’ mouths post production and recording sounds). Lips on the back of her hand like we used to do in the 6th grade, making smacking and sucking noises, is exactly how “kissing” is done in Hollywood (or, at least how it is recorded for sound). King has looped for seven seasons of “Melrose Place” and on films like What’s Eating Gilbert Grape with Johnny Depp, and Man without a Face with Mel Gibson. But it is often her role in 1981’s Friday the 13th that holds the most ardent fans. “Alice is such a touchstone,” she says. The character was the quirky, non-traditional, character who surprised everyone by fighting back—and King, somewhat like the character, fought back from her diagnosed Post Traumatic Stress Disorder by reuniting with her fans. In 2017, King received the Trailblazer Award from Idaho Horror Film Festival. Now, she attends events supported by fans thirty-eight and a half years later. “I own every year with pride,” she says.